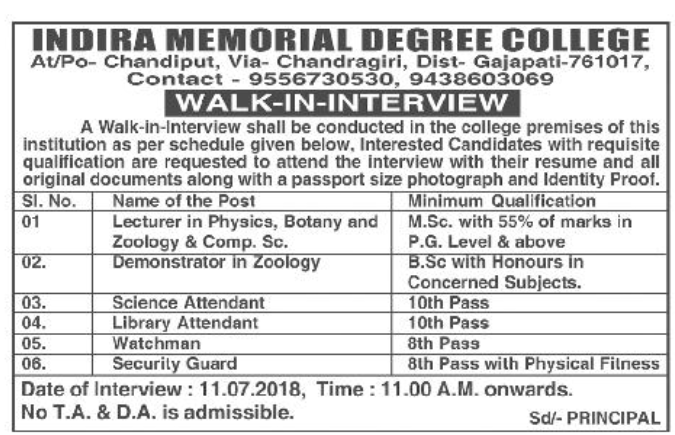 Indira Memorial Degree College, Chandiput has advertised in the Samaja newspaper for recruitment of Teaching Faculty- Lecturer,Non teaching faculty jobs vacancies. Interested and eligible job aspirants are requested to interview on 11.7.2018.Check out further more details below. For the post of Lecturer- M.Sc with 55% of marks in PG level & above. For Demonstrator: B.Sc with honours in concerned subjects. No T.A ,D.A is admissible. How to Apply: Interested candidates are to come and attend interview on 11.07.2018, time:11a.m onwards. 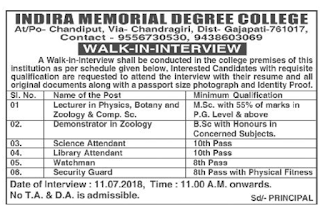 Reference: Recruitment Notification / Career Job Opportunities notice for Teaching Faculty -Lecturer,Non Teaching Faculty on Samaya newspaper Dated 6th July 2018.